Most of the evidence of the existence of a secret facility at Papoose Lake is anecdotal. Tales told by people, which we have no way of confirming. But there are other things that can be considered, things that are public and can be verified. Common sense things like if “A” exists, then so must “B” and “C”. If a facility exists, even if highly secret, there must be some sort of legal property ownership. Also there are certain bureaucratic patterns that can be looked for, and their presence (or absence) can be revealing. Finally, to paraphrase Jaques Vallee, sombody has to take out the trash. Personally, I think the most convincing evidence is what you see with your own eyes. In the absence of making a trip to Papoose, satellite photos provide the next best thing. On July 17, 1988, a Soviet reconnaissance satellite snapped a photo of the Groom/Papoose area. Fortunately, it was good weather and a high quality photo resulted. It was a photo destined to surface in many incarnations in later years. It first appeared in (and on the cover) of the March, 1994 issue of “Popular Science”. It also is the basis for the Lazar poster, with an enlargement of the Papoose Lake area (although with a funky red tint and contrasted all to hell). Finally, it’s available in two views in the info booklet accompanying the Testors “Sport Model” modeling kit. In fact, the photo was originally acquired by John Andrews of Testors for the model, and made the rounds from there. I have been extremely fortunate to have had access to an excellent enlarged print of the photo, from the original negative, and was able to spend many hours studying it. So, just what does it show (or not show)? Before I get into that, I want to point out that the enlarged view of Papoose Lake in the Testors booklet is an excellent representation, although it’s obviously not a photographic quality reproduction. So if you have it, you can join in. I’d recommend getting the model kit, if only to have your own clean copy of the photos. The other photo it includes is a very nice large scale view of the entire Groom/Papoose area, from the NTS all the way east to the Tikaboo Valley. The Lazar poster is also decent, but only covers Papoose Lake.. There is really only one location that fits Lazar’s description. It’s on the east side of the lake bed, just north of a natural “tongue” that sticks out into the lake. This is the only location the Papoose mountain range comes down to anywhere near the lake as a collection of low foothills. 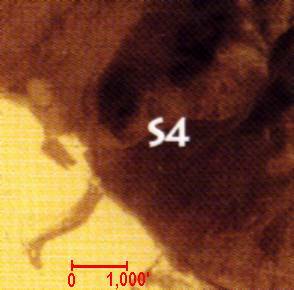 The Testors booklet conveniently labels the spot as “S-4”. At other points along the range, the mountains are quite a distance from the lake, up an alluvial plain. Problem is, there’s nothing there! Absolutely nothing. A facility such as Lazar described would have to leave traces easily visible on a photo with the resolution of this one. Even assuming the facility is hidden in the hills, there is no sign of an access road (which Lazar described as good), no sign of a fenced area (and the accompanying marking of terrain it would leave), no sign of terrain scuffing from people walking around or even from hauling discs out of the hangars onto the lake. It’s not as if these things won’t show up on the photo, as they do in other areas near Groom. Guard vehicle turnaround spots on the dirt roads are clearly seen. The photo is also clear enough to easily make out all the dirt roads down to the 4wd level. By using the main access roads around Groom as a reference, it’s obvious which are the good roads and which are not. The road running down to Papoose Lake on the west side of the Papoose Range, appears to be a very poor road, except for the most northerly portion. The road deteriorates as it nears Papoose Lake, and dumps into the north end of the lake bed itself. There are a few 4wd routes crossing the lake, but nothing approaches the likely location of S-4. I’ve also compared the photo to old high resolution aerial photos from 1959 and 1952, obtained from the USGS. There is no discernible difference in the location, either in landform or shading. Nothing has changed. I will concede that given enough money, effort and secrecy hysteria, it would be possible to hide a pretty large sized facility. But the kind of extreme measures it would require, such as concrete access roads painted to match the surrounding desert, were not what Lazar described. Further, who are the operators of the facility supposedly hiding it from? Lazar said he was told the Soviets were once part of the program, but were kicked out for unknown reasons. If they were in it, they must certainly have known of the existence of a Papoose facility. When most people think of Area 51, they tend to think of the 46 by 50 mile rectangle of restricted airspace shown on aviation sectional charts. It’s an often shown graphic for various media pieces on the place. But in probability (I’d like to say fact, what with this place, who can be sure! ), those are not the boundaries. The boundaries are much smaller. On June 25, 1955, Public Land Order 1662 went into effect. It withdrew about 60 square miles of land from public use, and turned it over to the Atomic Energy Commission ostensibly for use in the Test Site. Through some sort of subsequent agreement, the AEC then passed control to the Air Force. This rectangle, measuring 6 miles north-south, and 10 miles east-west was the new home of Watertown Strip, the new U-2 test facility. The facility was, and is, centered in the parcel. It seems the boundaries remain to this day. A careful examination of photos taken over the years (both aircraft and satellite) show that almost all structures associated with the Groom base remain within the boundaries set forth so long ago. It appears even the black world recognizes property lines. What this means is that Papoose Lake is not within the safe confines of Area 51. In fact the north edge of the lake bed is a full 4 miles south of the Area 51 boundary, located on routine Nellis Range property. There are a couple of confirmations to this property arrangement. 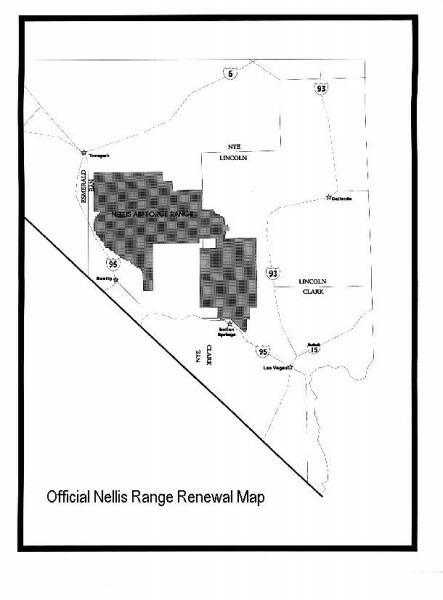 The Nellis Range is currently undergoing a public renewal process. In their official maps of the range, they indicate they are responsible for the Papoose area. Their maps show that the NTS and the 6 by 10 mile Groom parcel are not part of the Nellis Range. Quite clearly, Papoose is. Another clue are the boundaries of the National Desert Wildlife Range. This is a national preserve covering much of the southerly portion of the Nellis Range. It’s goal is to protect and preserve the natural state of the area (While at the same time the Nellis boys blow the hell out of it). The Wildlife Range does include a lot of public land east of the Nellis Range. Checking with USGS and wildlife range maps shows the west boundary of the Wildlife Range abuts the NTS, and its northwest corner abuts the 6 by 10 mile Area 51 parcel. This means that Papoose Lake is situated within a national wildlife preserve. So consider this scenario. You’re a facilities planner working to locate a super-secret facility. Are you going to put it on plain ol’ ordinary military reservation land, when just to the north there is already a highly restricted area in existence? An area that could easily be extended and provide the physical, legal and bureaucratic protection necessary? And would you put it in, or allow to be created over it, a wildlife preserve??? Groom Lake is in the center of a “box” of highly restricted airspace that was created on January 15, 1962. This was done as part of the A-12 program just getting underway at the Groom Lake base. These secret, high performance craft needed a much larger buffer around them than had previously existed at Groom. This “box” of airspace is connected to another “box” over the NTS to the west. Together they make up R-4808N. When I referred to the airspace as being highly restricted, that also means it’s restricted to the boys flying out of Nellis on training missions. To those unlucky pilots who accidentally cut through a corner during the excitement of war game maneuvering, a whole pile of trouble awaits. OK, so the airspace is real restricted. That makes sense, doesn’t it? Well, yes it does. It’s there to protect Groom Lake. The problem is that most of Papoose Lake is not under this airspace! 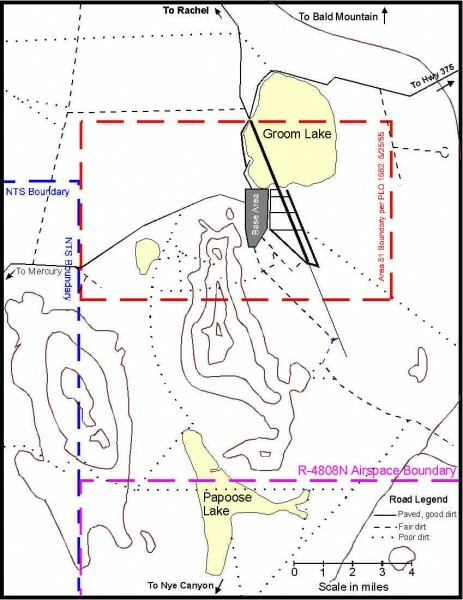 A look at the map of the area shows that the southerly boundary of the restricted zone runs across Papoose Lake just southerly of the “tongue” that extends from the east edge of the lake (The most likely site of the mythical S-4). This means the entire southerly half of Papoose Lake is fair game to Nellis jet jocks. 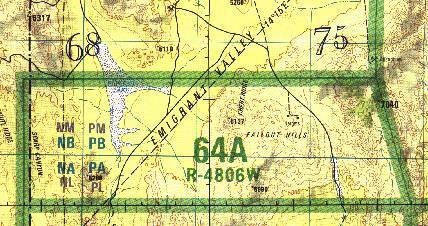 In fact, the area is listed on the Nellis Range chart as Range 64A (map 44k jpg), with targets located in the east portion in the Fallout Hills. Were there actually discs at Papoose Lake, any military pilots passing by in Range 64A would only have to look out their canopies and see the shiny round things on the lake bed below. Such a situation makes little sense. Were there some sort of highly secret installation near the shores of Papoose Lake, then it would be reasonable to expect that the Groom “box” would have been extended to cover it better. The Cammo Dude manual is the affectionate nickname of a document that arose (it is my understanding) out of the toxic waste lawsuit filed by Jonathan Turley. It is, in essence, a job description manual on how to be a Cammo Dude (more properly known as a security guard) for Area 51. Judging from all the tantrums the Air Force threw when they found out Turley had the manual, it’s likely the real thing. The Air Force tried very hard to get it back from him. Once it got placed on the Internet, the issue became moot. By careful reading of the manual, certain clues suggest it dates from the mid to later 1980s, before Lazar went public with his story. The manual contains a wide range of information, from how to handcuff subjects to how to place vehicle intrusion detectors. It has emergency reporting priorities for both security and fire personnel, identifying what sites take precedence over others (The base bar, Sam’s Place, ranks a lowly 19th!). It also has a “local terminology list” (i.e., code words) identifying many of the local facilities, roads and landmarks. Accompanying the manual was a very comprehensive list of all buildings and structures in Area 51, along with their identification numbers. But what is most interesting, at least for purposes of this discussion, is what it doesn’t contain. There is no mention whatsoever of the Papoose Lake area.. While the building inventory lists 5 microwave buildings, a power shed and a latrine on Papoose Peak, nothing is shown anywhere near Papoose Lake. While the manual goes into some detail about procedures for entering and passing through the Test Site, there is no mention that Papoose is out of bounds in any way, or that special security concerns exist there. Likewise for the security reporting priorities. Papoose simply isn’t there. The manual lists 43 different code words for people, places and things in the Groom area. Other than identifying Papoose Mountain as “P-1”, it has nothing to say about Papoose. Were there any installations at Papoose Lake, it is reasonable to expect the manual would at least refer to the area with some sort of code word and mention what procedures are necessary prior to entering. At the very least a point of contact would be expected to be given. All this is lacking however. The conspiracy minded bunch out there will likely suggest that the lack of any mention of Papoose is suspicious in itself. While I won’t totally dismiss the idea, a careful reading of the manual, as well as the lines between the lines, overwhelmingly supports the idea that there just isn’t anything to be found at Papoose. Also remember the manual dates from before Lazar popped publicly forth, so there would be no reason to completely erase any mention of Papoose. When active testing of nuclear devices was still going on at the Test Site, protesters were a routine part of the mix. The NTS and the protesters seemed to have developed a protocol as to just how each side was to behave, and how the protesters could be most efficiently arrested. Ah, the good old days. One of the more imaginative protest groups was Greenpeace. Not content to simply step across the line near the Mercury entrance, they organized and pulled off forays deep into the NTS. For one of these excursions, they decided to send a small party into the NTS on a multi-day trip from the east side, to come in the back way, so to speak. The group left from the National Desert Wildlife Range and proceeded northwest to the Test Site. In doing so, they crossed Papoose Lake itself. They came across no heavy security, and saw no secret saucer bases. There was nothing there. It was just a dry lake bed. As I understand the story, they eventually reached the Test Site and were of course arrested.